True, you usually have to do something to put yourself there in the first place, ie, my weekly visits, but, sometimes, things do just seem ‘meant to be.’ Seneca put it much more eloquently: ‘Luck is what happens when preparation meets opportunity,’ he said. Anyway, this pretty much sums up how I found myself donning a fluorescent yellow PPE vest, hard hat, gloves, protective glasses and size 8, metal-toed builders’ boots (two sizes too big for me!) to join a contractors & clients tour around the Tankerville site on Wednesday 13th January. 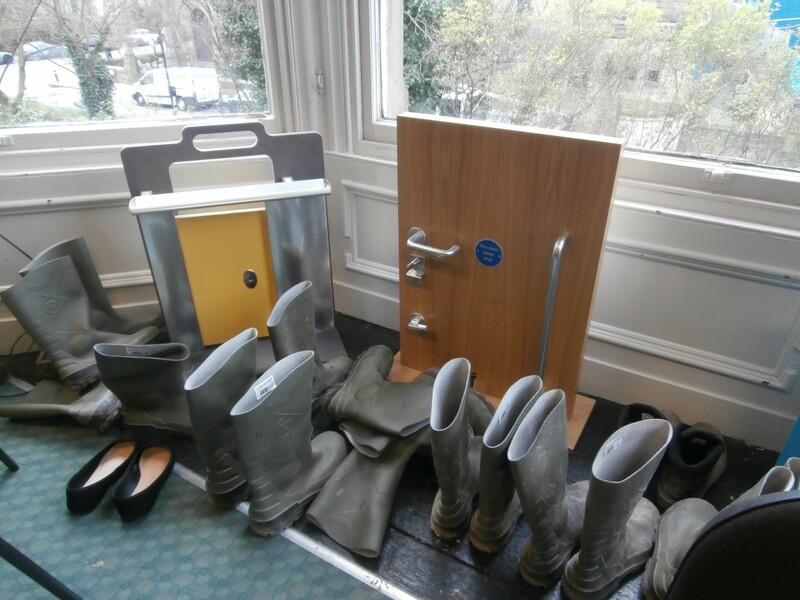 Metal-toed builders’ boots & very familiar blue-green carpet. I’d taken my usual photos and had already stood a bit longer musing on the new work now underway in the area of the boiler room. I don’t teach on Wednesday afternoons, but, nevertheless, I rarely stay out for more than about 35 minutes at the most. 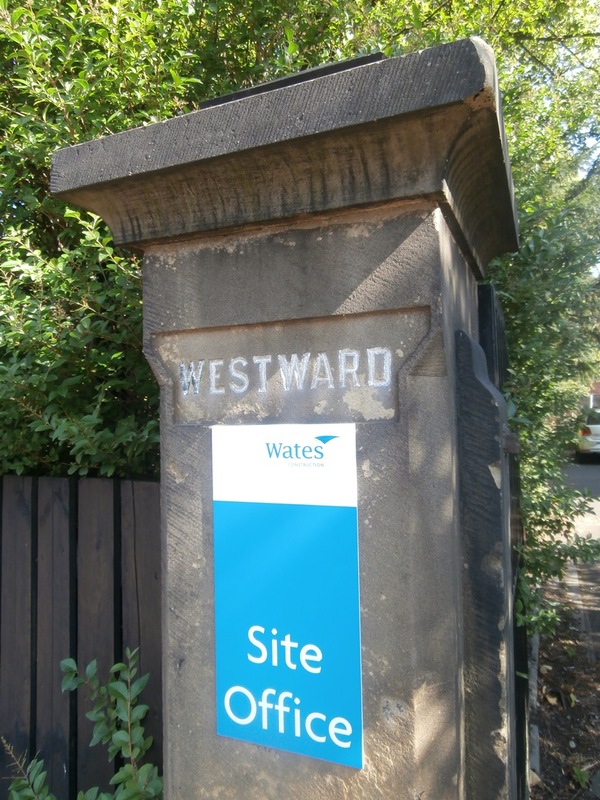 I had been longer than that already today when, walking back past the Wates Site Office in Westward House, on the spur of the moment I decided to pop in there-and-then to check the name of someone for the blog. Westward House: Wates Site Office, latterly home to the Church High School of Music. Nick White was in a Health & Safety meeting, so I said ‘no worries’. 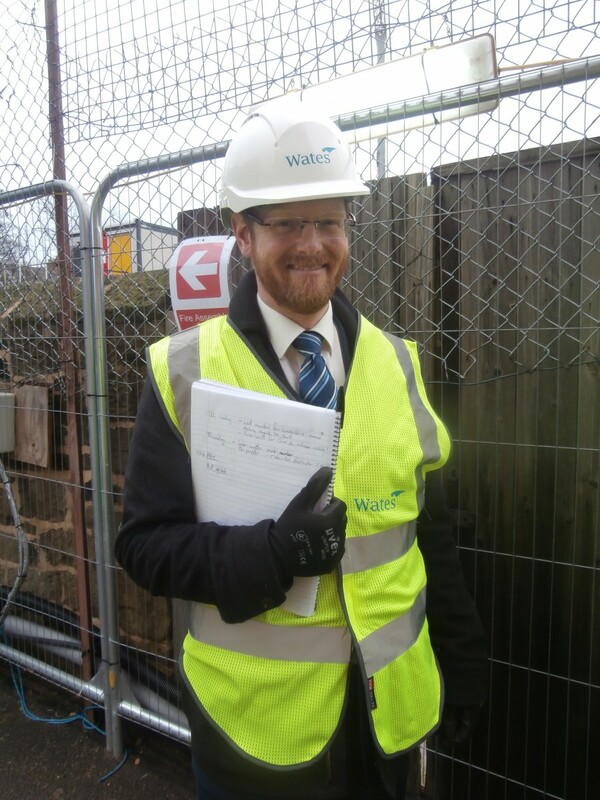 Ever helpful, however, Wates insisted on letting him know I was there. Nick came out, we went into the next room, he wrote down the man’s name for me and, as I left, I bumped into Hilary French on the stairs. We chatted briefly as more people started arriving. Even when I heard her say, ‘Is there space for Christine?’, the penny still didn’t drop what was actually happening. John Crosby, Director of Finance and Operations at NHSG later told me the EWA team were all only there at that exact time because the London train had been delayed by an hour. Now if that isn’t Fate, I don’t know what is? John Crosby, Director Finance & Operations. I don’t go there very often because it’s a busy working office, but it’s always nice to be in Westward again where most of the walls are still painted pale blue and the woodwork all dark green: ‘The blue of the sky/And the dark green of the forest.’ All visitors must report to Reception on the first floor where a very helpful young lady sits at a desk on the right at the top of the stairs. I’m not sure what this little room was used for at Church High, but it takes only a small stretch of imagination to conjure up keyboards again in the left-hand office. 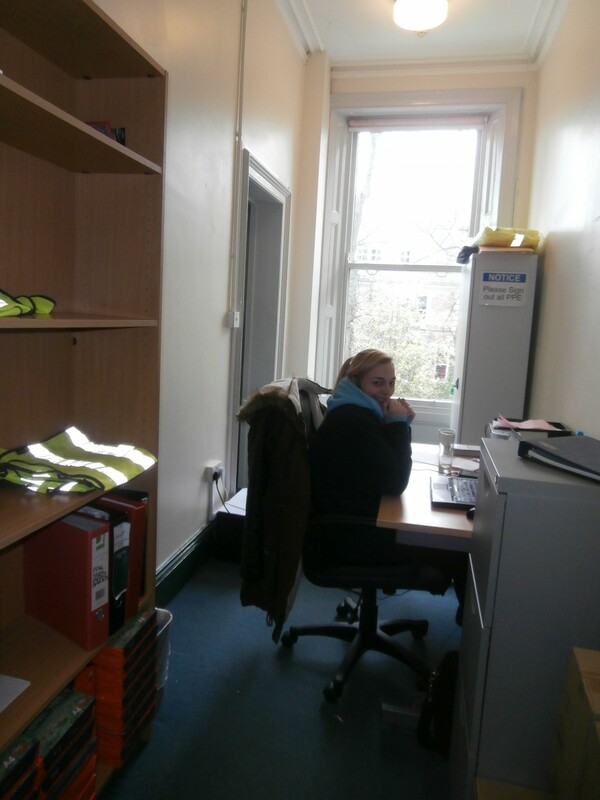 Receptionist, Amy: guardian of the PPE kit. The tour party I was joining turned out to include a wide range of people. It was fascinating to meet Christine Sills and Mark, both architects. Another gentleman explained he was one of the electrical contractors; he was interested to see the way the buildings were progressing even though his lighting units haven’t been installed yet. To enter the site, we had to go through an elaborate series of gates and a huge security turnstile. From that point on, I was always towards the rear of the group, constantly stopping to take photos for the blog. Keenly aware of the privileged position I now found myself in, it was an obvious decision to record as much as possible digitally and allow my camera to serve as your eyes too. Inside the old building, we couldn’t get near the front entrance today; it was blocked off because of the work going on in that area. I only became aware of this retrospectively, however, because our attention was intently focused on new developments in the LRC. 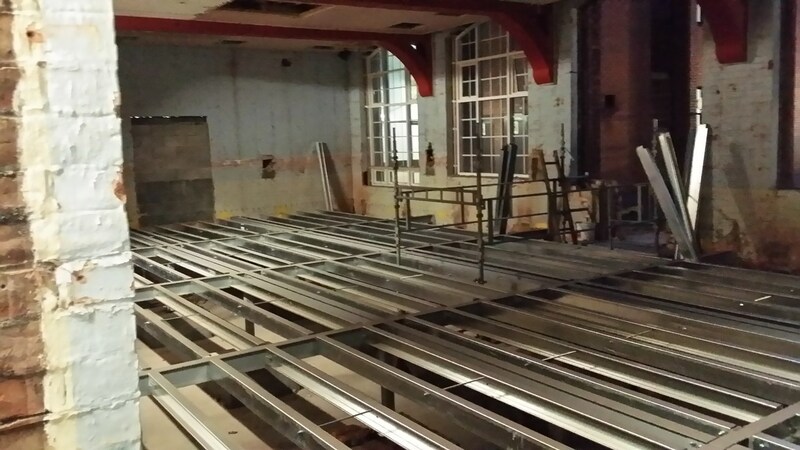 The steelwork of the newly raised floor was now in place. To me, it just looked so very small. The newly-raised floor makes the LRC seem very small to me. I have thought long and hard about how best to describe what it felt like to be walking round the old Church High building once again. I could say it was just like meeting up with a old friend again after not having seen them for a while and it was – we just picked up where we left off despite a gap of a year and a half. In the end, however, I realised the best way of all was just to let you see for yourself. Enjoy! You have done an amazing job bringing to life in words and pictures the ‘old girl’ as she is transformed. Exciting times ahead!